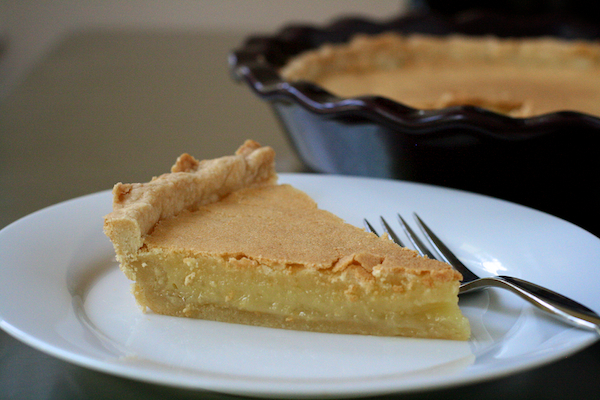 Holidays with my mother’s family included one staple whenever my grandmother, Alice, was involved – her chess pie. Chess pie was always a bit of a mystery to me. I never knew quite what was in it – and really didn’t care, honestly. I just knew that I liked it an awful lot. If given the choice between pecan pie or chess, I’d choose the chess pie any day of the week. At some point over the last ten years or so my grandmother stopped making the chess pie, along with other classics like her banana pudding. Luckily, I was able to get a handwritten copy of her recipe which I’ve kept folded up in a little box in my kitchen for the past several years. 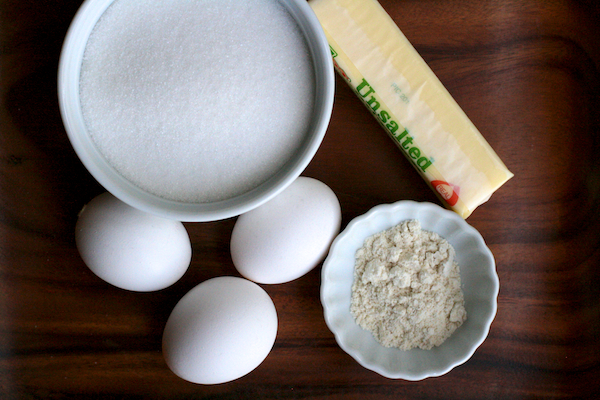 The basic ingredients in chess pie. Except I forgot to add butter to mine. Oops! Chess pie is a classic southern dessert. 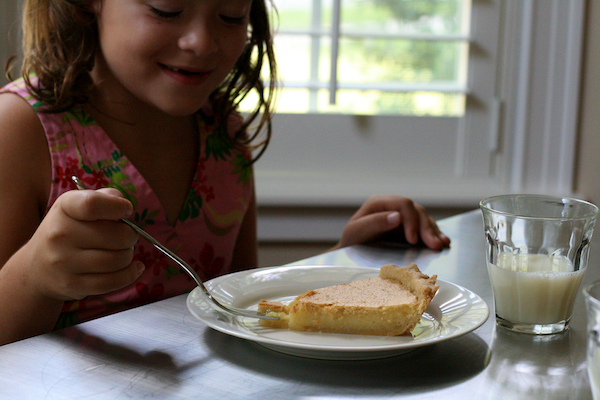 There is some controversy surrounding the exact origins of the chess pie, sometimes called vinegar pie. 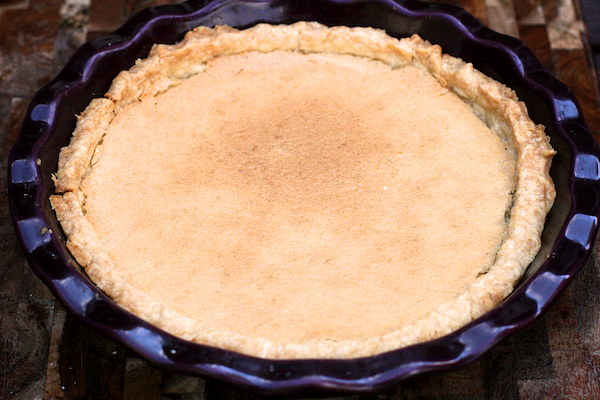 According to my copy of James Beard’s American Cookery , the chess pie or tart was originally from England and then brought to New England and Virginia where it was served “more as a tea accompaniment than as a dessert pie.” I’m not sure James Beard and my grandmother are referring to the same type of pie, though, because the recipes are somewhat dissimilar. Putting all the questions about the origins of the pie aside, I can give you some facts about this chess pie recipe. First, along with pumpkin pie, it’s the dessert I most associate with holidays and family. Second, this chess pie recipe came to me from my grandmother, Alice, whose family is originally from Tennessee, so the pie is truly a southern classic. Alice learned the recipe from her mother, Offie. And before Offie, the chess pie recipe came from Offie’s mother, Amanda. Amanda lived from 1861 to 1935, and she was my great-great-grandmother. So, this chess pie recipe is at least from the late 1800s. Chess pie batter is fairly thin and runny. This past weekend I made the heirloom chess pie recipe. It tasted just as it did in my taste memory. The top of the pie crackled under the gentle pressure of the fork, just as I remembered, and the inside was thick and creamy. And sweet! 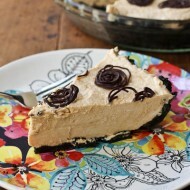 Oh, this is one sweet pie. Imagine a pecan pie without the pecans, but with a thicker filling — and better, really — and I think you’d have something fairly similar to a chess pie. This is a pie that deserves a cup of coffee or a glass of ice cold milk, or perhaps a slice of bread (as my mom would prefer), to cut the sweetness. She and I shared that moment at the table — two forks, two glasses of milk, one piece of pie, years and years of history thick in the air — and it was the best piece of chess pie I’d ever tasted. I should point out that the original recipe called for one stick of melted butter in the batter. When I made the pie, I melted the butter in the microwave and let it sit for a while to let it cool. Unfortunately, I found the butter - or, rather, my husband did - two days later, still in the microwave. I had completely forgotten to use it. The pie was just perfect without it. 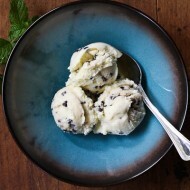 So this recipe? I didn't use butter, and I don't recommend it. Preheat oven to 350 degrees. Combine sugar and cornmeal. 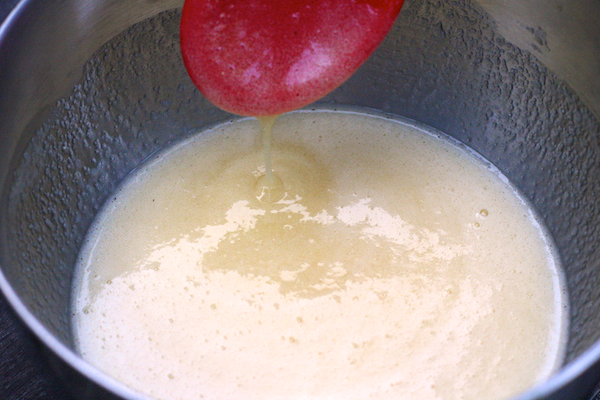 Add beaten eggs and milk, and mix well. 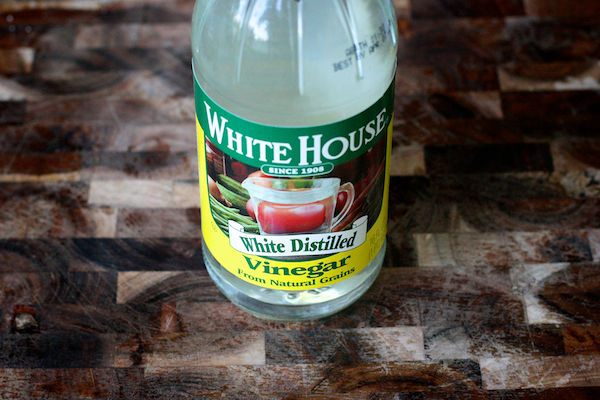 Stir in vinegar and vanilla. Mix until well blended. Pour into the pie crust and bake at 350 degrees for 10 minutes. Turn oven temperature down to 325 and bake for additional 40 to 45 minutes or until center of pie is set. Turn oven off and let the pie cool in the oven. Oh, my God. What a beautifully written post. Now I want to eat the peach dessert. God has raised you, not me or your father. Your compassion, your anguish at such an early age… Girly, I love you. Oh, Mom. I love you, too. What a beautiful story. Your love and compassion for people is wonderful. Good bye’s are hard but don’t you feel so fortunate to have made such a big difference in someone’s life and they love you for it. Keep up the wonderful work. Merry Jennifer, what a beautiful post. It’s clear that you are in your profession because you’re meant to be there. It must be amazing to watch you work. Your beautiful heart must be such a balm in painful moments, I’m sure of it. You’ve been through so many goodbyes this year. It speaks volumes that you’re able to find the beauty in the sorrow. It took me a while to realize why goodbyes hurt so much for me, especially with my grandparents. And then I realized it was because they loved me SO well, that my pain was equal to their love. There was something very balancing about that realization – I accepted the pain then, because it was a way to say thank you for loving me so well. And then it was easier to move on, and simply relish each memory. I hope that each day brings a little less pain, and a little more love to embrace. Thank you so much, Amber. And I think you’re right about the level of hurt equaling the level of love. Each of us has many gifts but not all of us use them for the betterment of others. Your writing and your chosen profession, just to name two have been a source of grace for more people than you can ever imagine. Final goodbyes are so important and when we come to terms with knowing it will take place we understand it is the acceptance that will light the passage with peace for our loved ones. While I might have stumbled upon your blog a few years ago because of the food (and I do love the recipes you post), I continue to come back for your beautifully written post–this one being no exception. Oh, I’m SO glad to hear that, Heather. Thank you for reading! a beautiful and poignant post. Thank you. You are not the only one who feared fire as a child. My fear started after watching a small airstream camper burn up when I was about 4 years old. At the time we lived in a single wide trailer and I associated it with the camper. From there after, I worried in the same ways that you did about fire and loss. Yes, even making contingency plans – just in case. It wasn’t until my mom was dying of cancer that I finally realized that it would be very selfish of me not to give her permission to pass on to the next phase in her life; death. I came to understand that there are worse things in life than dying. Suffering from an incurable illness being one of them. BTW – I made a peach cobbler recipe this summer from Southern Living too. I did a little (to much) modifying of the recipe and I should have left well enough alone because I needed a chain saw to cut it! Merry-Jennifer, your writing always moves me and this post is certainly no exception. What a blessing you must be in the lives of your patients. That kind of caring and compassion is rare indeed. So beautiful. You truly are a gem. I always read your tasty posts and devour them with as much gusto as your tempting recipes! This post is especially vibrant and full of life. I recently found your blog and thought I would enjoy the recipes, and I do, however I have received so much more. Thank you for your beautifully written posts. Merry – This is wonderful with or without the recipe. I’m so humbled by your ability to keep saying goodbye and to do it with grace like this. Thank you for sharing. This was such a touching story. Your compassion and caring nature are a true gift. This was such a lovely post to read, one that hit close to home for me. Very sorry to hear about your patient. It’s wonderful she had a doctor like you to understand and care for her. I used to do what you did with the stuffed animals, only for me they were guardians to keep at bay anything that might come my way at night. They would fight fire and monsters for me. I was also equally terrified when my dad travelled (and he travelled a lot for work), worried that the plane would crash, that he might meet some monsters, that I would never see him again. The fact that he always came back didn’t lessen my fears. But the fact that good-bye would always become hello did calm me down after a while. My dad has dementia now, and is here but not really. There will be no opportunity to say good bye in any comprehensive way. I wish more than anything that he’d just look at me and say hello, the way he always did when he got back. But still I will always be grateful for all those times he did come back safely. I’m trying to focus on the good times. Beautiful post–you always have such a way with words! 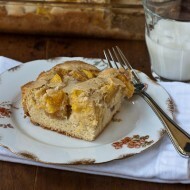 And the peach cobbler bars look amazing too. Hauntingly sweet, genuine, touching, and worth the wait. As always thank you for sharing so much of yourself here with us. 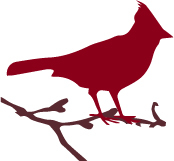 Pingback: Best of the Blogs | Never Enough Thyme — Never Enough Thyme - Recipes with a slight southern accent.